Herod Agrippa, the grandson of Herod the Great and king of the Jews, grew wroth against the Church of Christ, and slew James, the brother of John the Evangelist. Seeing that this pleased the Jews, he took Peter also into custody and locked him up in prison, intending to keep him there until after the feast of the Passover, so that he could win the favour of the people by presenting him to them as a victim. But the Apostle was saved when he was miraculously set free by an Angel (Acts 12:1-19). 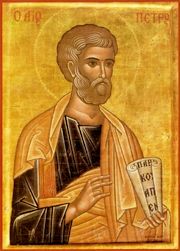 The chains wherewith the Apostle was bound received from his most sacred body the grace of sanctification and healing, which is bestowed upon the faithful who draw nigh with faith. That such sacred treasures work wonders and many healings is witnessed by the divine Scripture, where it speaks concerning Paul, saying that the Christians in Ephesus had such reverence for him, that his handkerchiefs and aprons, taken up with much reverence, healed the sick of their maladies: "So that from his body were brought unto the sick handkerchiefs or aprons, and the diseases departed from them, and the evil spirits went out of them" (Acts 19:12). But not only the Apostles' clothing (which certainly touched the bodies of the sick), but even their shadow alone performed healings. On beholding this, people put their sick on stretchers and beds and brought them out into the streets that, when Peter passed by, his shadow "might overshadow some of them"(Acts 5:15). From this the Orthodox Catholic Church has learned to show reverence and piety not only to the relics of their bodies, but also in the clothing of God's Saints. Share the feast of Veneration of Apostle Peter's Precious Chains with an icon greeting ecard.